April Cornell - Live Beautiful: Happy Obama Day! Republican, Democrat, Independent, Progressive, apathetic -- we can all be proud to have elected the first African-American President of the United States! Barack Obama has united the country and has also reunited us with the rest of the world -- across the globe, countries are celebrating Obama Day. In India, our friend Shiv has baked chocolate cake and is celebrating this momentous event in Delhi. Our designer Donna is there and is incredibly moved by the fact that this country, halfway around the world, has embraced our new president and has renewed hope for the US. In Rome, our Manager's cousins are glued to the TV, waiting for the speech. In England, our graphic artist's inlaws are impressed with the president-to-be, and are looking forward to looking forward! 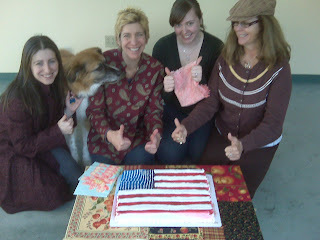 Here in our office in Burlington, Vermont, we are anxiously awaiting the inauguration, and we will be eating cake!!! Hurray for Obama! Hurray for America! It is amazing and fun! Spread the word! Love your blog! I'm loving all of your beautiful new fabrics, pop in for a visit when you have time! I'd love to add your site to my Creative Places list!